Today we have the latest KTT (Kitchen Table Tangles) video from Zentangle’s co-founders Rick Roberts and Maria Thomas. This was released to the public in the latest edition of the Zentangle newsletter. Background: The KTT videos are available in the Zentangle Mosaic app. Although most of the KTT videos are only available to the subscribers of the paid version of the app ($2.99/month, or $24.99/year), occasionally Zentangle makes a KTT video publicly available and I also add it to TanglePatterns as we’re doing today. Visit the ZENTANGLES > ZENTANGLE KTT VIDEOS page on the top menu bar for more information about the app and a complete list of all the available videos. Sit down at their kitchen table with Rick and Maria and learn about tranzending, a new technique for adding layers of tangles to your Zentangle tiles (9:40). The term tranzending is also located on the ZENTANGLES > ZENTANGLE TERMINOLOGY page. 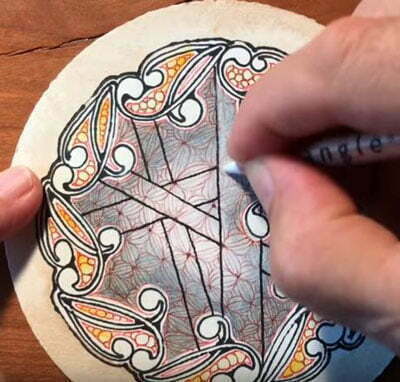 Zentangle co-founder Rick Roberts demonstrates tranzending, the technique of adding layers of tangles to your Zentangle tiles. CZT Certification Seminar dates for 2018 have been announced! Registration isn’t open yet and I will let you know when it is (in a couple of weeks) but for your planning purposes, Zentangle HQ has just announced the dates for its three certification seminars for next year. The seminars are held at the Providence Biltmore Hotel in Providence, Rhode Island USA. Visit the ZENTANGLES > TEACHING ZENTANGLE® > HOW TO BECOME A CERTIFIED ZENTANGLE TEACHER tab on the top menu bar of any page on the site for more information.